Now that I've wrapped up my many-hours-long playthroughs of 9 Hours, 9 Persons, 9 Doors and Hotel Dusk (read my impressions of this pair of top-shelf DS games here and here), I'm finally spending time with some other titles I've been eyeing up for ages. Specifically, I'm spending time with Danganronpa: Trigger Happy Havoc, The Legend of Legacy demo that hit the 3DS eShop last week and Mr. Driller: Drill Spirits. 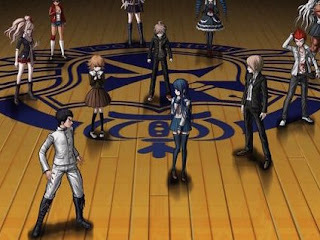 Danganronpa: Trigger Happy Havoc (Vita)--I started playing this Vita-based visual novel earlier this year but then moved it to the back burner because ... actually, I have no idea what prompted me to walk away from it for a bit. Anyway, the few hours I’ve played of Danganronpa since I wrapped up 999 a couple of weeks back have been pretty darn enjoyable. In large part, that's because I really like this game’s unsettling atmosphere. Its jazzy, low-key soundtrack is partially responsible, too. One aspect of Danganronpa that I’m currently reveling in and reviling in equal measure is its free-roaming nature. On the one hand, I love being able to move around as I please, but on the other, that flexibility makes it easy to get lost—or at least become confused as to where I'm supposed to go or what I'm supposed to do next. Of course, that’s a problem I've had with every single visual novel I’ve played to date, so maybe I shouldn't point to it as an example of something that's wrong with this particular example of the genre. I'd recommend taking all of the above with at least a medium-sized grain of salt, by the way. I still have a long way to go before I see Danganronpa's credit roll, so it's more than possible my opinions of this much-acclaimed game will change between now and then. 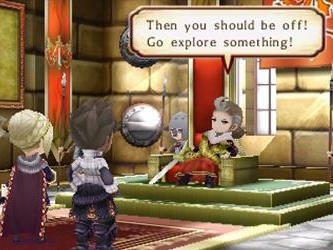 The Legend of Legacy demo (3DS)--In the six days since I downloaded this demo, I've put nearly five hours into it. That alone should indicate how much I'm digging it, as only the most special of games are able to grab that much of my attention these days. So, which of The Legend of Legacy's components are most responsible for me feeling so gaga about it at the moment? One would be the map-drawing focus of its overworld and another would be the strategic, turn-based nature of its fights, that's for sure. Speaking of The Legend of Legacy's overworld, I've become similarly enamored with the pop-up effect that's used with such confidence in each and every area you're tasked with exploring within this demo. I'm sure some will find it maddening, but I think it meshes well with the rest of the game's coloring-book aesthetic. So, which of this FuRyu-made and Atlus-published (in North America) RPG's many components have yet to trip my trigger, as that quaint old saying goes? The best example I can come up with is its character designs. Although I love the frog prince, Filmia, and the bosomy Amazon, Eloise, I find the rest of this game's potential party members to be a snooze. Sadly, I consider even the most boring character designs to be downright thrilling when compared to the majority of The Legend of Legacy's enemy designs. A few of the bosses showcased in the demo are OK, but the rest of what's on offer here is blah at best and tragic at worst. All that said, I'm very much looking forward to getting my hands on the full, retail version of The Legend of Legacy halfway through October. I don't suppose any of you are in the same boat? Mr. Driller: Drill Spirits (DS)--I've got to be honest here: when I bought Drill Spirits, I did so expecting not to like it very much. My previous experiences with the Mr. Driller series left me cold, mainly because they made me think there was absolutely no depth to its gameplay. Still, I've always loved the series' protagonist, Susumu Hori, and I've also always loved its Candy Land graphics, so I picked up Drill Spirits in the hopes that they would prompt me to fall in love with the rest of what Mr. Driller has to offer. Has it succeeded? Actually, I think it has. After all, I've devoted more than three hours to Drill Spirits in the last week or so. I'd say the most positive thing about my playthrough (if it even can be called that) of Mr. Driller: Drill Spirits so far is that it's gotten me to stop thinking of this series as being one full of releases that feature paper-thin gameplay. No, there isn't a ton of depth to be had here, but there's more than initially meets the eye, that's for sure. 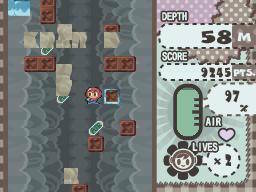 Even if that weren't the case, though, I'd still probably get a kick out of Drill Spirits' frenetic excavating action. I don't know that I'd call it fun, exactly, but it's definitely satisfying--especially whenever I'm able to complete a level without any special-item assistance--and that's more than enough for me right now.